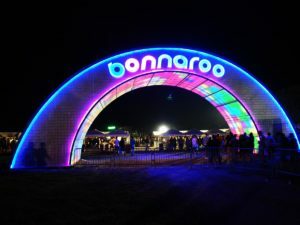 How to go to Bonnaroo for Free! Bonnaroo 2017’s lineup is stacked. With artist like Travis Scott and Red Hot Chill Peppers everyone wants to go, but not everyone has the money. There are a few ways to go to Bonnaroo with out spending a 400 dollars on a ticket. These methods work for other big music festivals like Coachella as well. Volunteering at a music festival is the simplest way to go for free. This year Bonnaroo has just gotten rid of the volunteer deposit. Volunteers actually receive a free ticket as well as 3 free meal tokens. Volunteering at a music festival can be really fun and you can meet lots of cool people. If you volunteer one year successful, the next year you can actually volunteer before the event happens, that way you don’t miss any. You could also become a Bonnaroo Ambassador. This is a new thing I have been seeing this year. If you can sell a couple tickets to your friends you are able to go for free. Another way to go for free is to join AXIS security. AXIS security works many music festivals, and you actually get paid working for them and you still can go for free. Go check out our newest market prediction that we just released 4 days ago, and start earning some money so you can go to some music festivals.